Hi Kevin, sorry, I inadvertently deleted your comment and I can’t comment on this blog anymore 🙁 That’s probably a bug you mentioned, though iNetHack is no longer maintained (by me). 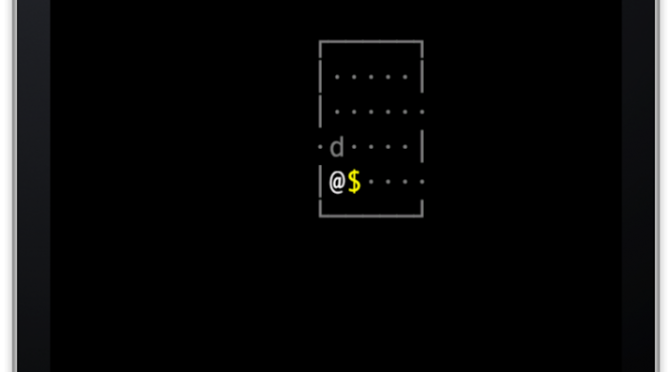 This entry was posted in iphone, nethack on 2012/12/13 by dirk. New UI (with all its bugs) or iNetHack-like shortcuts? So you’ve played the Slash’EM iPhone port. Some have noticed that it contains bugs 🙂 Many of them are very hard to get rid of. It’s certainly not impossible but maybe a little impractical for a port. The reason is that the UI builds and sends keyboard macros to the core, like ‘Tc’ to take off ‘c’. Can lead to weird behavior if you’re not wearing anything else and ‘c’ is uncursed. Or if you die just after the core has processed ‘T’ you just skipped the DYWYPI prompt (I can’t thoroughly explain it but I’ve experienced similar situations). The alternative is to get back to a shortcut system. Maybe refine the way to build your own on-the-fly (which would then be subject to the bugs just mentioned though). Maybe even leave that out to avoid those bugs. Some Slash’EM features can remain (e.g. the context menu seems quite stable if you omit direct item interaction). What would you prefer? Please leave your vote in the poll to-left! 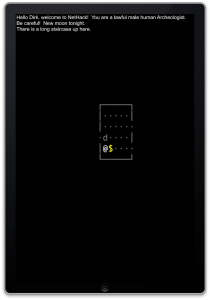 This entry was posted in inethack, iphone, nethack, slash'em, UI on 2010/07/02 by dirk. 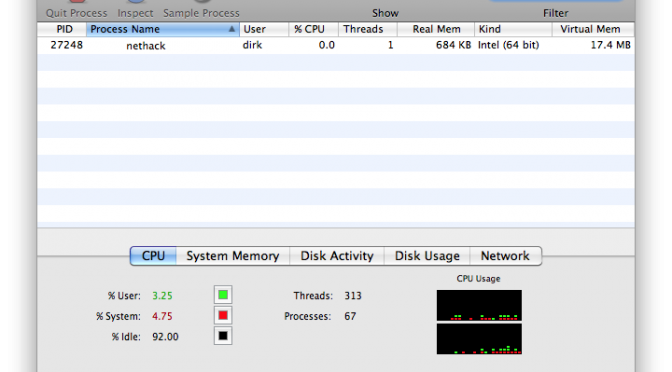 Just wanted to say that I’m aware of iNetHack’s performance issues on iOS 4. This forces me to change plans and port it to iHack as soon as possible. Before that I will release some Slash’EM bugfixes, which will hopefully add iOS 4 fast app switching (at this stage there are still major problems with it, but I don’t want to give it up yet), since Slash’EM and iNetHack will (hopefully) soon share the same exact iHack UI code. This entry was posted in inethack, ipad, iphone, nethack, roguelike, slash'em on 2010/06/25 by dirk. 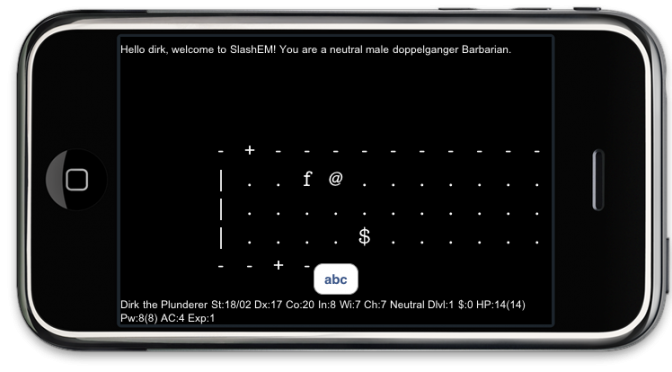 Eventually there will be both a Slash’EM and iNetHack in the app store, both universal, with a very similar UI. iNetHack will remain vanilla NetHack, Slash’EM is based on the latest stable release (Vampire) with the force-patch. Once that is done NetHack HD will be removed. Has been in development on and off for about five months (eternal beta?) and is nearing a release. The UI is different from iNetHack, there are no shortcuts, and the consensus from the beta forum seems to be that it’s a more efficient UI. A public release for iPhone is in sight. After that I have plans to modify it into a universal app (with basic UI changes) so it will make use of the iPad’s screen estate and special controllers. I consider its current codebase obsolete and it will get replaced by the Slash’EM UI. I don’t fix iNetHack bugs because most of them are already fixed in Slash’EM or a non-issue there due to the different UI. I accept them though for the time being and will address them one by one as soon as it gets its new codebase. Developed completely in the dark without device or beta testers, it has quite some issues, including UI and performance (I only ran it shortly last week on an actual iPad and I wasn’t thrilled). It will be pulled from the store as soon as Slash’EM and iNetHack go universal. It currently has no public source distribution and there won’t ever be one since it’s already obsolete. Has (minor) issues of its own which will get addressed but has low priority for me since I’m focusing on iDevices. I hope this clarifies some things. The google code repositories will very likely be moved to github. Well-done patches are always welcome. This entry was posted in inethack, ipad, iphone, nethack, roguelike, slash'em on 2010/05/09 by dirk. In the middle of preparing NetHack for the iPad I felt the need for a simple todo manager. My spiral notebook that I’ve been using for that kind of thing simply didn’t cut it for me anymore, it was too much hassle to move tasks between projects. So I looked online but I didn’t find exactly what I needed, so I made an app for that. Check! is pretty simple. You can add tasks, and every task can have subtasks, and since a subtask is a task as well it can have subtasks. Repeat until your memory is exhausted. The tasks on the main screen can serve as categories and important projects, as in the screenshot. This organization has proven to be working quite well for me, but Check! is flexible enough for other models. There are no due dates and no explicit use of priorities, though you can certainly change the order of tasks to indicate priorities. If you are done with something simply swipe-delete it. In 1.0 you can shake your iPhone/iPod to enter edit mode, in 1.1 (not yet approved) there is a button for that. If you want to support further iHack* development and/or need a simple task manager download it here. If you want to write a review let me know so I can send you a promo code. 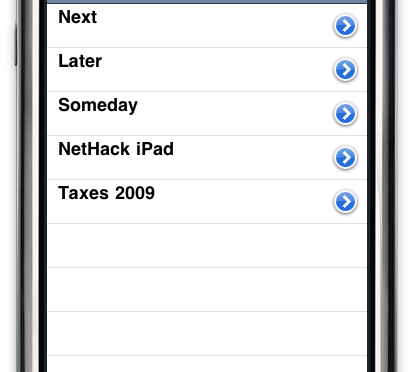 This entry was posted in apple, check, iphone, manager, task, todo on 2010/02/19 by dirk. That’s what I’ve been working on since iNetHack 1.3 hit the app store. I’m rewriting the window engine from scratch, taking only general purpose classes and header stubs from iNetHack. The goal is to make it much more modular, maintainable, reusable etc. (attributes which quite frankly weren’t on the top of my design goals for iNetHack). This will also leed to some UI experiments in collaboration with the test team and hopefully come back as the base for the next iNetHack and more to come. 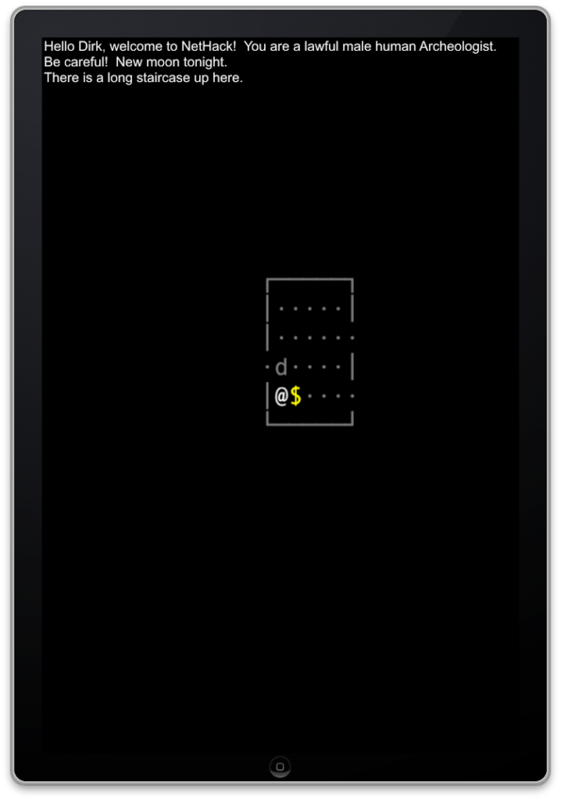 This entry was posted in iphone, roguelike, slash'em on 2010/01/08 by dirk. This very probably still leaves some structure alignment differences between sim and device, since they don’t share bones very well, though they both operate on the same byte alignment (little endian). This entry was posted in inethack, iphone, nethack on 2009/12/17 by dirk. This entry was posted in inethack, iphone, itunes, nethack, roguelike on 2009/09/16 by dirk.